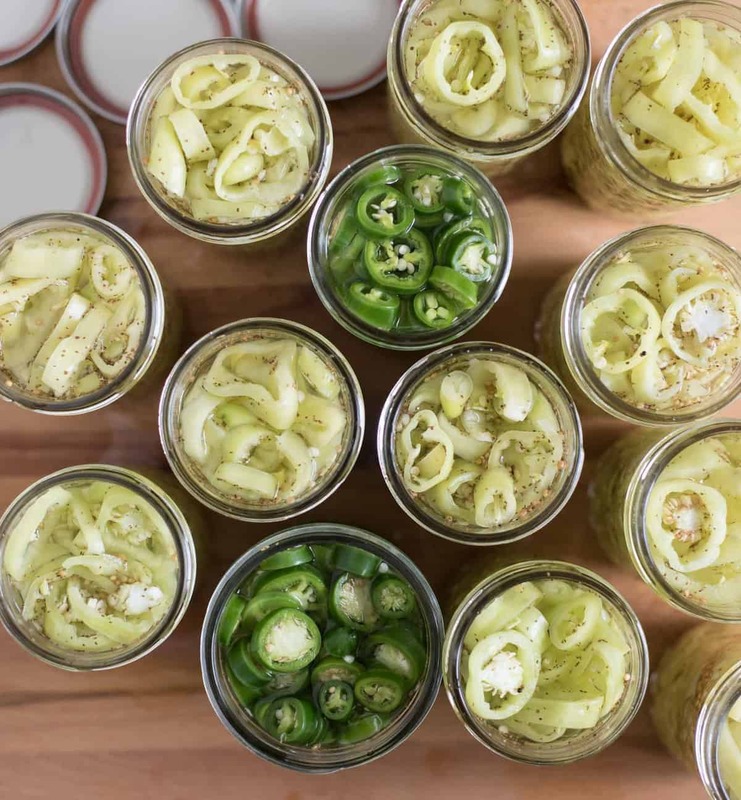 A quick and easy guide on how to pickle peppers using a hot water bath canning method, which produces shelf-stable pickled peppers you can eat all winter long. The garden is booming and I’m really excited about all things canning, pickling, and fermenting this year. I made this giant batch of pickled banana peppers and did twice this many pickled jalapeños this week (those are our all-time favorite). I’m also in the middle of my first try at crabapple jelly and I made a batch of super thick homemade Greek yogurt yesterday in the slow cooker. On top of that, I got a few more quarts of green beans canned. Preserving the harvest while it’s here is such a fun hobby. 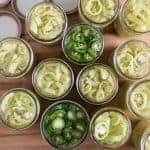 I thought I’d share how to pickle peppers, which is a super simple recipe for you fellow garden growing, home canning, yogurt making friends. Peppers grow like weeds and when they are on, they are on. My tomatoes are oddly slow to turn red this year, so I have tons of peppers and no tomatoes to turn everything into salsa. That’s ok though, because pickled peppers are the best. We eat pickled banana peppers with our favorite pizza, on veggie + hummus sandwiches, and when we make sandwiches using our favorite homemade sub bun recipe. 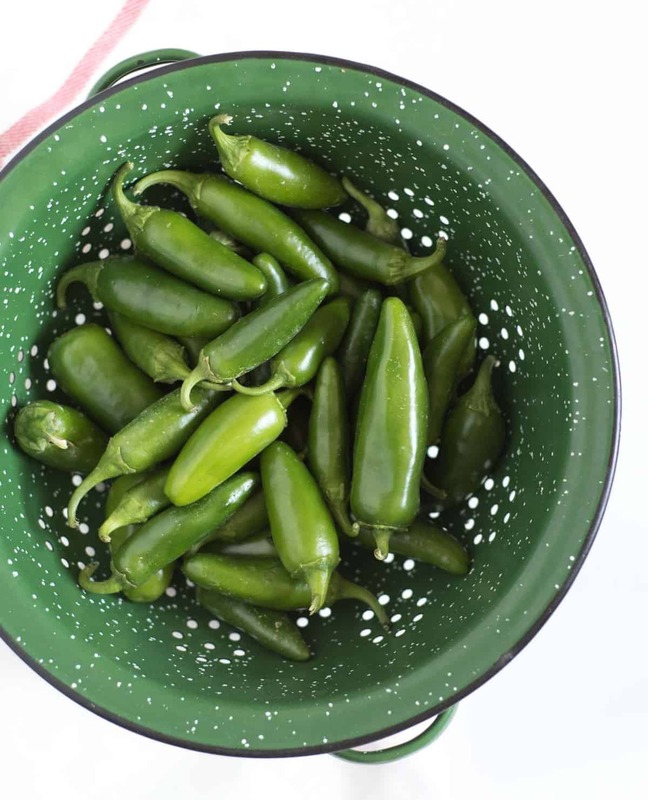 We eat the pickled jalapeños on everything Tex-Mex like our favorites slow cooker carnitas, black bean and sweet potato enchilada bake, and the best chicken tacos. You won’t believe how easy these recipes are. Once you get the canning bug, you’ll never go back. This is a great place to start! Wash peppers and chop into rings (wear gloves to avoid heat of the peppers burning the skin). 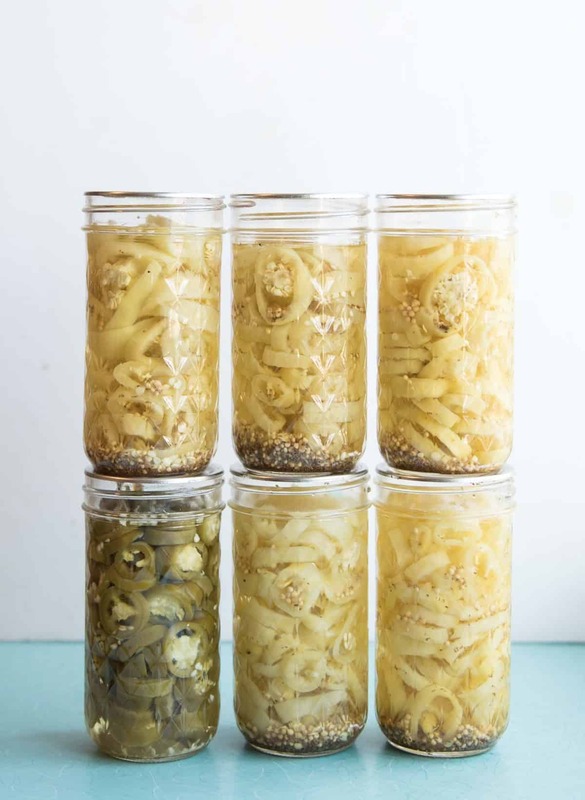 Pack sliced peppers into clean jars. Pour hot brine over peppers. Process in a hot water bath. 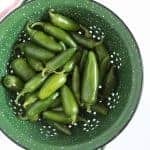 A simple recipe for making pickled jalapeño peppers at home and preserving them by using a hot water bath method. Prepare the peppers by washing them. Remove the stem end. Slice the peppers into rings that are 1/4 to a 1/2 inch thick. Wash your pint canning jars and prepare the lids according the manufacturer’s directions. Pack the sliced peppers into the prepared jars. In a large pot, combine the vinegar, water, salt, sugar, and garlic. Bring to a boil and simmer for 10 minutes. Remove the garlic. Ladle the hot liquid into the jars, leaving a 1/2 inch of head space at the top. Remove any air bubbles and adjust the liquid as needed. Wipe the rim of the jars clean and add the lid and ring. Process in a hot water bath. Here’s a great trusted resource on boiling water canners. Process for 10 minutes. If you are above 1,000 feet elevation, process for 15 minutes and above 6,000 feet elevation, process for 20 minutes. Wear rubber gloves when handling hot peppers or wash hands thoroughly with soap and water before touching your face. Recipe from, tested, and approved by the National Center for Home Food Preservation. You can visit their post here if you have furthers questions. 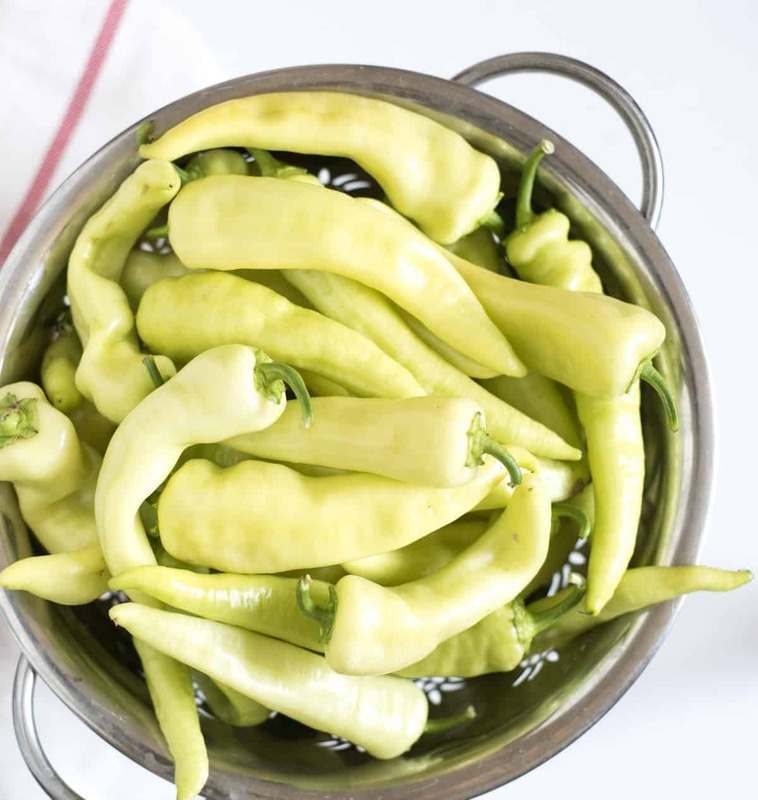 A quick and easy recipe for canning and pickling banana peppers, making them shelf-stable and ready to eat all summer long. Wash and rinse 4 pint canning jars. Prepare lids and bands according to manufacturer’s directions. Wash peppers well and remove the stem end. Slice into rings that are between 1/4 inch to a 1/2 inch thick. In a large pan, add the vinegar, water, and salt and heat to boiling. Place 1/2 tablespoon celery seed and 1 tablespoon mustard seed in the bottom of each clean jar. Fill with pepper rings. Cover the pepper ring with the boiling vinegar mixture, leaving 1/2 inch headspace. Remove air bubbles and adjust the liquid as needed. While the rims of the jars clean and adjust the canning lids. Process in a boiling water canner, as recommended (see notes). Let cool 12-24 hours and check the seals. Shake the jars to disperse the spices before using. Process for 10 minutes. If you are above 1,000 feet elevation, process for 15 minutes and above 6,000 feet elevation, process for 20 minutes. New to canning? Here’s a great overview on boiling water canning. You’ll love eating on the veggies that you grew all winter long. I also love that I know exactly what is in them! No extra dyes, preservatives, or stuff you don’t really want or need in your diet. Long live simple whole food recipes that can be enjoyed when snow is on the ground. 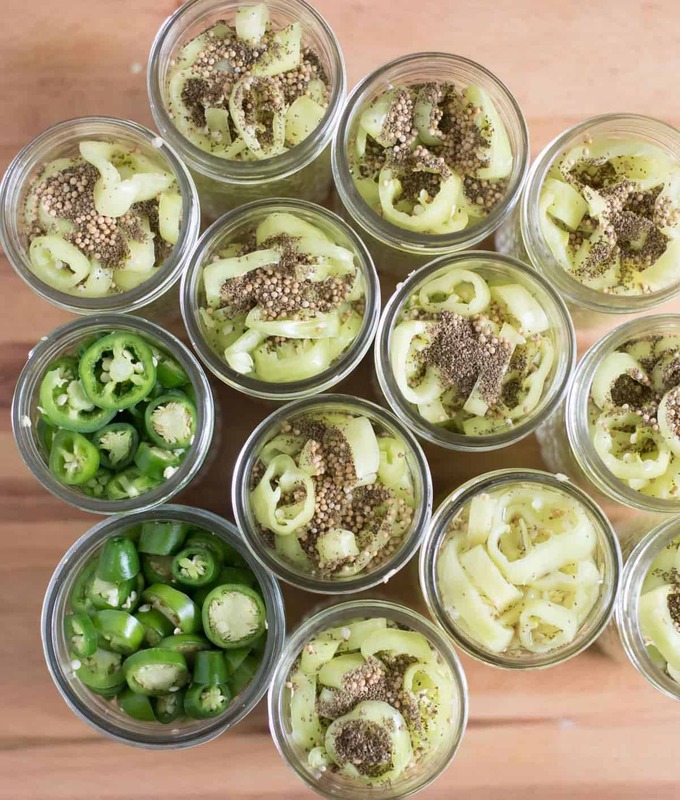 If you didn’t know how to pickle peppers, now you do! How do you feel about canning recipes? Would you like to see more of them on Bless this Mess? I’d love to know! These pickled peppers sound wonderful. I love canning vegetables from the garden too, it always tastes great in the dead of winter. I am new too canning but don’t you mean “cool” for 24 hours rather than “cook”? (Mean typo). This looks good! And you say you’re trying crabapple jelly for the first time? Once you try it, you’ll never want to Not make it! Nothing compares to the color and flavor, and is sooo good on toasted English muffins!